How to play Apple Music on SanDisk Clip Jam? 8GB storage, built-in microSD™ card slot and 18 hours battery charge make SanDisk Clip Jam a wonderful digital music player to take it anywhere! Simply drag, drop and play the tunes you want to hear—whether they’re MP3, WMA (no DRM), AAC (DRM-free iTunes), and Audible (DRM only). Even if you have downloaded the Apple Music songs for offline listening, you can't transfer them to your MP3 player since they are DRM-protected. However, if you can convert Apple Music M4P songs to DRM-free MP3 format, you can then enjoy them on any music player you have. Boilsoft Apple Music Converter is such Apple Music to MP3 converter which allows you easily convert Apple Music M4P songs to MP3 on Mac/Windows PC. You don't even need to download the songs. Besides, it converts Apple Music M4P songs to MP3 at 16X speed and preserve all metadata. Metadata preserved to MP3, M4A output files. This tutorial will show you how to convert Apple Music M4P songs, tracks and playlists to MP3 to play on any MP3 music player. How to convert Apple Music songs to MP3 and play on any MP3 player? 1. 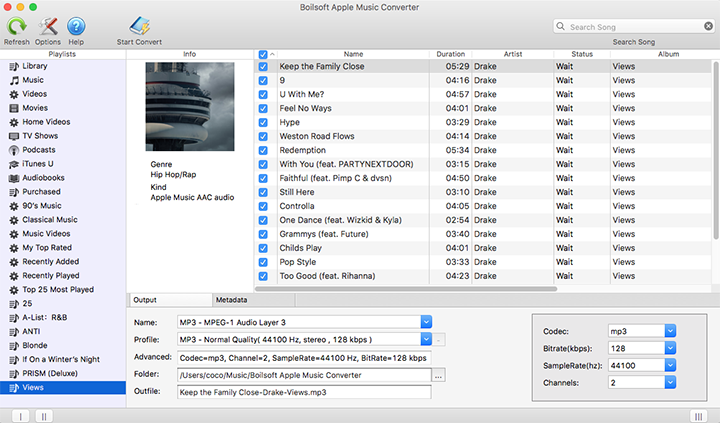 Download and install Boilsoft Apple Music Converter on your Mac or Windows. 2. 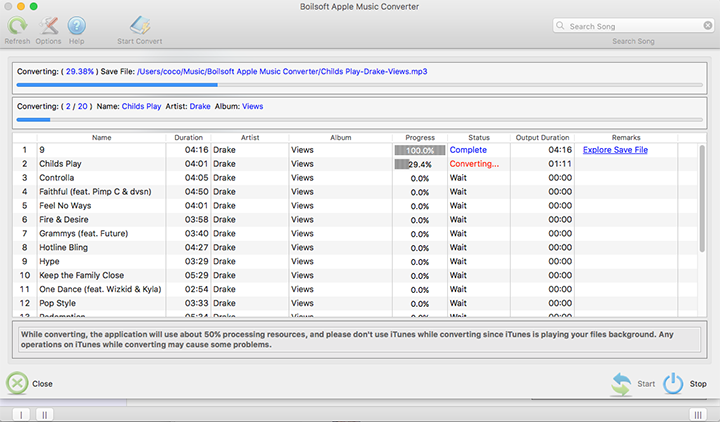 Run Boilsoft Apple Music Converter, iTunes will be launched automatically. 3. On Boilsoft Apple Music Converter interface, you will find all you Apple Music songs and playlists you have added to iTunes library, together with iTunes songs, movies, TV shows, audiobooks, etc. Check the checkbox before the Apple Music songs you want to convert to MP3. You can also search the Apple Music songs you want with the searchbox. 4. Choose output format, customize profile, name format if you like. Boilsoft Apple Music converter allows you to convert Apple Music M4P songs to MP3, M4A, AC3, AAC, AIFF, AU, FLAC, M4R and MKA. Select the format you want. It provides 3 profile settings for each output format: Normal, High and Low with different Bitrate, SampleRate and Channels. You can also customize the values as you like. 5. Click Start Convert button to start converting selected Apple Music songs to MP3. After conversion, locate the songs and transfer them to your MP3 players.